Butyric acid derivatives are salts and esters of butyric acid that are predominantly used in animal feed application. These derivatives provide several benefits such as enhanced digestion, enriched metabolism, and protection from harmful microbes. They also promote colon health of farm animals. Various salts and esters, such as sodium butyrate, calcium butyrate, potassium butyrate, magnesium butyrate, and esterified tributyrin, are available in the market. However, sodium and calcium butyrate are the highly consumed butyric acid derivatives across the globe. It is vital to convert butyric acid into butyric acid derivative to reduce the pungent odor and corrosiveness. Thus, most of the butyric acid is manufactured in the salt form or is converted into the salt form. The butyric acid derivatives market is expected to expand at a CAGR of 10.3% during the forecast period. Rise in population, improvement in standard of living, and growth in disposable income have boosted the demand for meat. This, in turn, is expected to propel the demand for butyric acid derivatives. Shift from beef and ruminant meat to chicken and pork is also estimated fuel the demand for butyric acid derivatives and other feed additives. Antibiotics and antibiotic growth promoters (AGPs) have been used in the animal husbandry industry since long. However, developed regions such as Europe and North America have started to experience the threats posed by misuse of antibiotics. Europe has banned the use of antibiotics and AGPs for farm use; carboxylic acid and derivatives are being used instead of AGPs. This replacement for AGPs by butyric acid derivatives is anticipated to be a key driver of the butyric acid derivatives market. Based on product, the butyric acid derivatives market is segmented into sodium butyrate, calcium butyrate, and others (including esterified tributyrin). Sodium butyrate is widely used across the industry for animal feed. It reduces the pungency and makes handling and use of butyric acid easier. Sodium butyrate is the leading product segment, as sodium butyrate provides significant benefits over other derivatives. It has better solubility as compared to its calcium counterpart. The antibiotic effect of sodium butyrate is also high vis-à-vis other derivatives. Furthermore, sodium butyrate molecules are smaller than that of calcium. The smell intensity and pungency of sodium butyrate is lower. Furthermore, the price of sodium butyrate is usually lower than that of calcium butyrate. Thus, the overall performance of sodium salt of butyric acid is better in all regions across the globe. 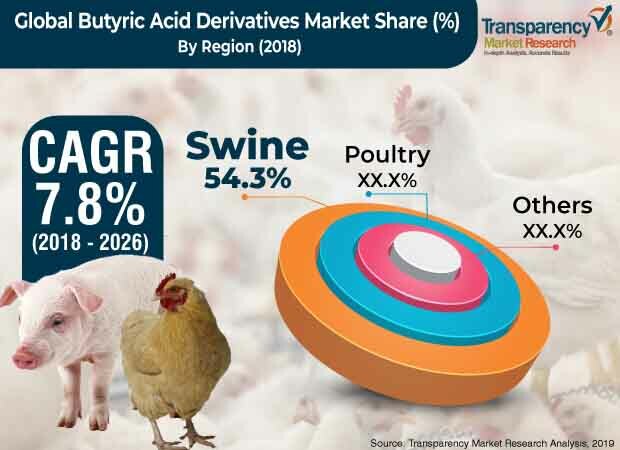 Based on animal feed, the butyric acid derivatives market can be segmented into poultry, swine, and others (including ruminants, aquaculture, and pets). Demand for white meat such as pork and chicken is rising significantly, especially in Asia Pacific. This increase in demand and production is boosting the global butyric acid derivatives market. Swine segment is the leading segment of the butyric acid derivatives market in Asia Pacific and Europe. However, the poultry segment leads in the remaining regions. Pigs require higher doses of butyric acid derivatives throughout their lifetime. This is driving the demand for sodium and calcium butyrate. However, the poultry segment dominated Middle East & Africa in 2017, as the region primarily produces poultry meat. In terms of geography, Asia Pacific was the leading consumer of butyric acid derivatives in 2017. Butyric acid derivatives are used extensively in meat production in the region. China is a major consumer of butyric acid derivatives due to its high rate of adoption in animal feed application. In terms of volume, China alone accounted for more than 30% share of the market in 2017. Furthermore, the country is a leading producer of butyric acid derivatives. Presence of large feedstock and existence of various butyric acid derivative processors in the region are expected to drive the butyric acid derivatives market in Asia Pacific. Europe followed Asia Pacific in terms of consumption. The region is a leading producer of pork. The market in North America is likely to expand significantly during the forecast period. The impact of ongoing research & development activities among universities and sodium butyrate and calcium butyrate processors in North America and Europe is high. Therefore, the butyric acid derivatives market in these regions is projected to expand at a rapid pace during the forecast period. Prominent companies operating in the butyric acid derivatives market are Perstorp Holdings AB, Nutreco N.V., Koninklijke DSM N.V., Kemin Industries Inc., Bioscreen Technologies S.R.L, Innovad, and Palital GmbH & Co. KG. Manufacturers of butyric acid derivatives are focusing on research programs and product development activities to cater to the rising demand for butyric acid derivatives in the animal feed application. This strategy enables prominent players to meet the increase in requirements of animal feed and gain dominant share of the butyric acid derivatives market. Butyric acid derivatives, also known as butyrate or butanoate, are salts or esters of butyric/butanoic acid. Sodium butyrate, calcium butyrate, potassium butyrate, magnesium butyrate, and tributyrin are some of butyric acid derivatives. Of these, sodium and calcium butyrate are predominantly used in animal feed products. Butyric acid derivatives are primarily offered in micro-encapsulated form for controlled release of butyrate in animal colon. Butyric acid salts are mainly used to boost animal colon and gastrointestinal health, and increase the overall meat yield from the animal. The report analyzes and forecasts the butyric acid derivatives market at a global and regional level. The market has been forecast based on volume (tons and kilo tons) and value (US$ thousand and US$ Mn) from 2018 to 2026. The study includes drivers and restraints of the global butyric acid derivatives market. It also covers the impact of these drivers and restraints on demand for butyric acid derivatives during the forecast period. The report highlights opportunities in the butyric acid derivatives market at the global and regional level. The report comprises a detailed value chain analysis, which provides a comprehensive view of the global butyric acid derivatives market. The Porter’s Five Forces model for the butyric acid derivatives market has also been included to help understand the competitive landscape. The study covers market attractiveness analysis, wherein products are benchmarked based on their market value, growth rate, and general attractiveness. The study provides a conclusive view of the global butyric acid derivatives market by segmenting it in terms of animal feed, product, and region. These segments have been analyzed based on the present and future trends. Regional segmentation includes the current and forecast demand for butyric acid derivatives in North America, Latin America, Europe, Asia Pacific, and Middle East & Africa. The report also covers the demand for individual product segments in all the regions. The study includes profiles of major companies operating in the global butyric acid derivatives market. Key players profiled in the global butyric acid derivatives market include Perstorp Holdings AB, Nutreco N.V., Koninklijke DSM N.V., Kemin Industries Inc., Bioscreen Technologies S.R.L, Innovad, and Palital GmbH & Co. KG. Market players have been profiled in terms of attributes such as company overview, business strategies, recent developments, and financial details. The report provides size (in terms of volume and value) of the butyric acid derivatives market for the base year 2017 and the forecast for the period between 2018 and 2026. Market numbers have been estimated based on animal feed, product, and region. Market value and forecast for each animal feed and product have been provided in terms of global and regional markets.